...an exlusive custom neighborhood of one-third to three-quarter acre homesites. 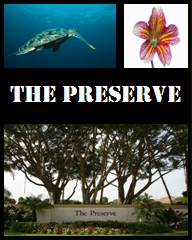 Pristine, quiet, gloriously refreshing... the Preserve is bordered by a 300-acre wildlife sanctuary. Sweeping views of the Tradition golf course, as well as nature trails add even more allure to this serene setting. The Preserve showcases fabulous custom estate residences, built by Ibis' participating award-winning builders.